The Spectroline® EagleEye™ 365 UV-A/White Light LED Hands-Free Inspection Kit is now available in a Deluxe, ASTM E3022-15 compliant version. 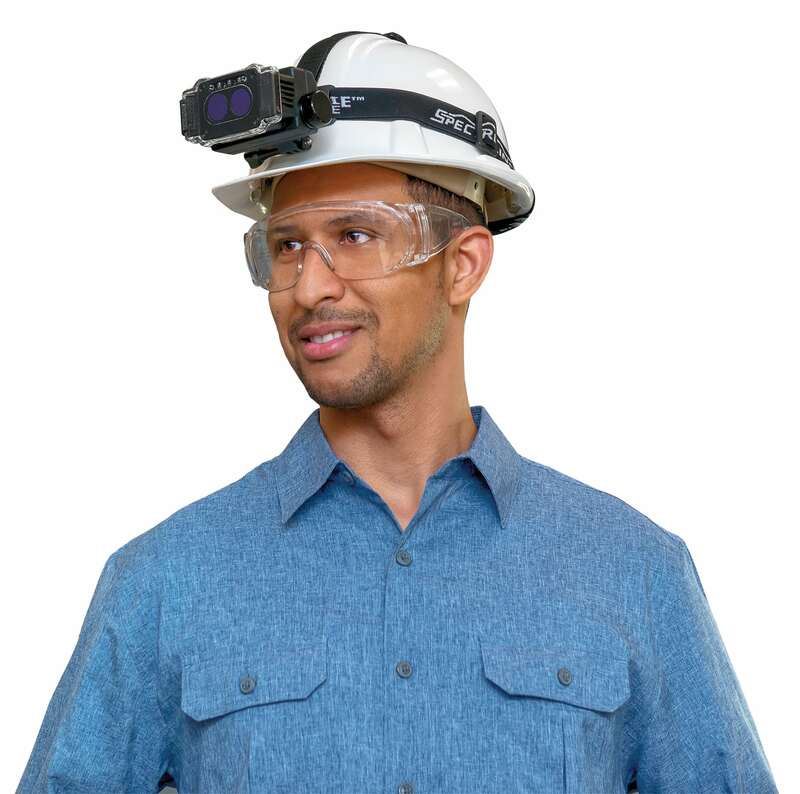 The new EK-3000SC kit is centered around the palm-sized, cool-running EagleEye™ inspection lamp (EE-365SC) – which can be fastened to a helmet or the user’s head by using the adjustable head strap, enabling hands-free magnetic particle inspection. In addition, the EK-3000SC kit includes a lamp mount/sprayer attachment. With the attachment, the EE-365SC lamp can be connected to an aerosol spray can and shone directly on the inspection area as the spray is discharged – eliminating the hassle of switching between an NDT inspection lamp, magnetic yoke, and aerosol spray can. The lamp is fitted with two UV-A (365nm) LEDs for inspection, plus three white light LEDs for general illumination. A built-in fan keeps the lamp cool and maintains optimum UV-A intensity during inspections. Powered by a rechargeable lithium-ion battery, the lamp has 90 minutes of continuous inspection time between charges. The Deluxe version also comes with new long-lasting UV-A lenses, integral black light filters, and splashguards. A serialized certificate of conformance to ASTM E3022-15 is supplied with each individual unit. 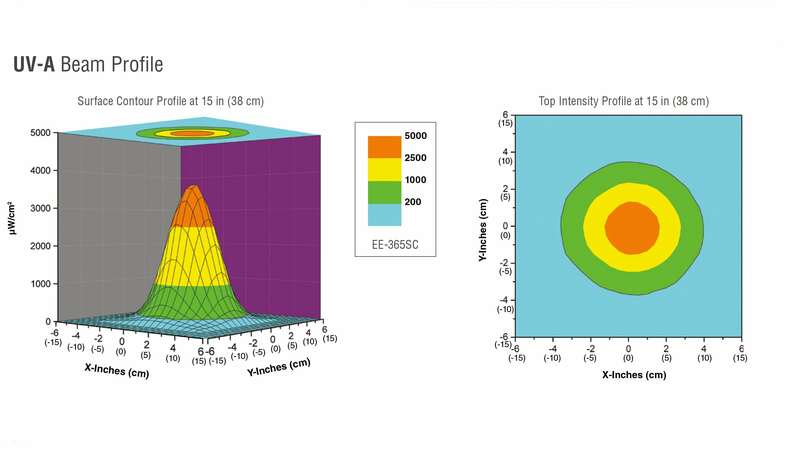 In addition, the EE-365SC lamp meets EN ISO 3059 international specifications for magnetic particle inspection. • Minimum nominal steady-state intensity of 3,500 ± 500 µW/cm2 at 15 inches (38cm). • Large coverage area of 5 inches with a minimum UV-A intensity of 1,000 µW/cm2. • Less than 1.0 foot-candle (11 lux) emission. • Certificate of Conformance to ASTM E3022-15 standard. • Meets EN ISO 3059 specifications. • Integral black light filters. • 90 minutes of continuous use. • Ergonomic and adjustable head strap. The adjustable head strap securely fastens the lamp to a user’s head or helmet. The mount/sprayer attachment connects the lamp directly to an aerosol spray can – enabling convenient, single-handed magnetic yoke inspection. 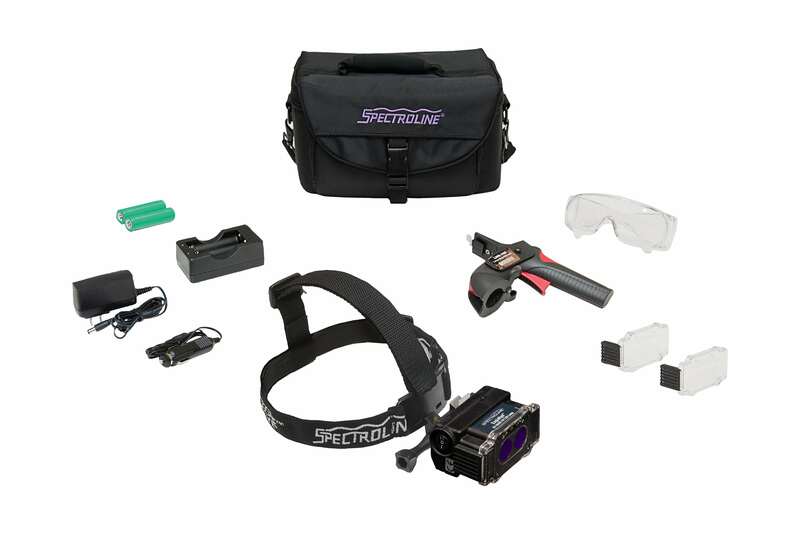 The EK-3000SC kit comes with a lanyard, two replacement splash guards with integral particulate filters, three lithium-ion batteries, a battery charging cradle with AC and DC cord sets, and UV-absorbing spectacles. All components are packed in a durable, padded carrying case. About Spectronics Corporation: Spectronics Corporation is the world’s leading manufacturer of ultraviolet equipment and fluorescent materials. Their state-of-the-art products are built to exacting engineering standards and are utilized for literally hundreds of markets and applications that demand uncompromising quality and reliability. Spectroline® UV lamps and radiometers are widely used to verify the structural integrity of military and commercial aircraft. Spectroline® fluorescent dyes are used to check for fluid leaks in power plants, nuclear reactors, oil pipelines and industrial facilities worldwide, and were even used on the U.S. Space Shuttle.